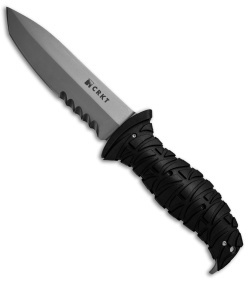 The CRKT Ultima offers a modern update to the classic fixed blade design. It has an innovative handle that was designed in collaboration with medical professionals for long-lasting comfort and grip strength. The injection molded GFN handle offers triangular grip segments with ooze grooves that channel away water, mud, and oil. 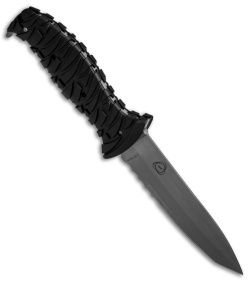 It has a titanium nitride coated blade with patented Veff serrations for precise cutting action. A heavy duty tactical sheath finishes off the undeniable design. Injection molded GFN handles offer extreme retention and grip strength. 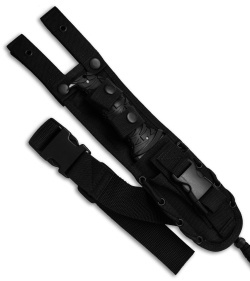 Heavy duty tactical sheath is MOLLE compatible with removable security handle straps. Titanium nitride coating for strong, durable finish.